Fast friends for life? That would be neat. 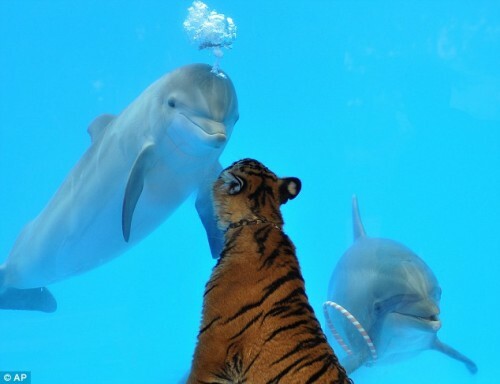 Love how the dolphin on the right is carrying his/her ring toy like a little kid. 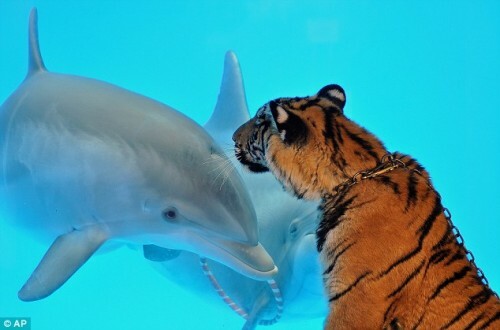 Tiger to dolphin; “What is thy bidding, my master”. Probably curiosity. You don’t see too many tigers underwater. @tiki god: thank you. please remember a tiger belongs to the cat family soo that his dinner. omg this fish is much bigger than the crap they feed me! yea, but dolphins aren’t fish. Don’t even taste like them. I would know. Unless I’m lying. Unless you mean this dolphin, which is a fish. I like the thought bubble above the dolphin’s head in second pic. Oh wait… real bubble. I wonder how often this happens in the natural world. Has to be really rare. 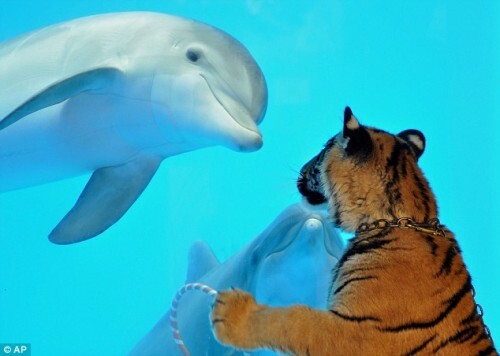 Dolphin: In yo dreams, Swatcat, In yo dreams… geez… Why u big cats always gotta has a ‘titude…?